In the 25th century, humanity faces powerful, hostile aliens. Our most faithful allies are the uplifted, intelligent Neo-Chimps and Neo-Dolphins, and the enigmatic, shapechanging Tymbrimi. 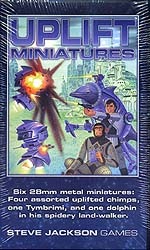 This set includes six 28mm metal miniatures: Four assorted uplifted chimps, one Tymbrimi, and one dolphin in his spidery land-walker - which can be built as either a civilian or military model.